2.1 The corporation is organized exclusively for holding title to property within the meaning of Internal Revenue Code Section 501(c)(7). The purpose of the Club is to bring together Amateur Radio operators who enjoy communicating by Morse Code (CW); to support operating and social activities for members, other Amateurs and their families and friends; to encourage the use of CW in Amateur Radio communications; to promote goodwill among Amateurs throughout the world; and to foster the education of young people and others in matters related to Amateur Radio. 3.1 The period of duration of this corporation is perpetual. 4.1 The corporation shall have one class of members with such rights as set forth in the Bylaws. They shall be of the same class and have equal voting rights. 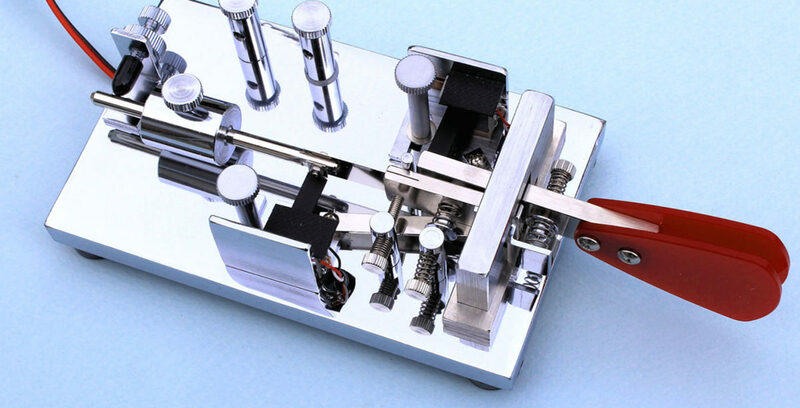 The membership will consist of licensed Amateur Radio operators around the world. Voting power shall be limited to those who are current and in good standing as regards dues and other requirements set forth in the Bylaws. 5.1 No part of the net earnings of the corporation shall inure to the benefit of, or be distributable to its members, trustees, officers, or other private persons, except that the corporation shall be authorized and empowered to pay reasonable compensation for services rendered and to make payments and distributions in furtherance of the purposes set forth herein. 5.2 No substantial part of the activities of the corporation shall be the carrying on of propaganda, or otherwise attempting to influence legislation, and the corporation shall not participate in, or intervene in (including the publishing or distribution of statements) any political campaign on behalf of or in opposition to any candidate for public office. 5.3 Notwithstanding any other provision of these articles, this corporation shall not, except to an insubstantial degree, engage in any activities or exercise any powers that are not in furtherance of the purpose of this corporation. 6.1 Upon the dissolution of the corporation, assets shall be distributed for one or more exempt purposes within the meaning of section 501(c) of the Internal Revenue Code, or the corresponding section of any future federal tax code, or shall be distributed to the federal government, or to a state or local government, for a public purpose. Any such assets not so disposed of shall be disposed of by a Court of Competent Jurisdiction of the county in which the principal office of the corporation is then located, exclusively for such purposes or to such organization or organizations, as said Court shall determine, which are organized and operated exclusively for such purposes. 7.1 Changes to the Bylaws may be initiated by petition from one member, approved by the Board and a majority of the voting membership. 7.2 Amendments to the Articles of Incorporation must be initiated by a petition signed by no fewer than fifteen active members, approved by the Board and ratified by a vote of two-thirds of the voting membership. 7.3 Notice of proposed changes and amendments shall be accomplished by emailing a copy of the proposal using the email addresses then available to the Secretary and publication on the members-only website. The Secretary shall specify a date by which responses must be received. 8.1 Officers shall be the President, Vice President, Secretary, and Treasurer. In addition, there shall be three Directors. These officers and directors constitute the Board of Directors (“Board”). Directors shall be elected by the members as set forth in the Bylaws. 8.2 The Officers and Directors shall have the duties and shall serve terms as specified in the Bylaws. 8.3 The quorum for a Board meeting will be five members. All votes of the Board shall require a majority of the quorum. In the event of a tie vote the proposal shall be deferred until a majority can be obtained, except as otherwise required by the Bylaws. 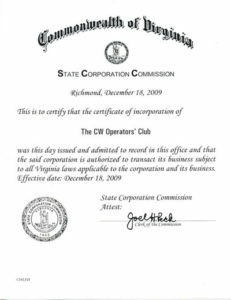 9.2 The initial registered agent is an individual who is a resident of Virginia and an initial director of the corporation. 9.4 The registered office is physically located in the county of Fairfax.